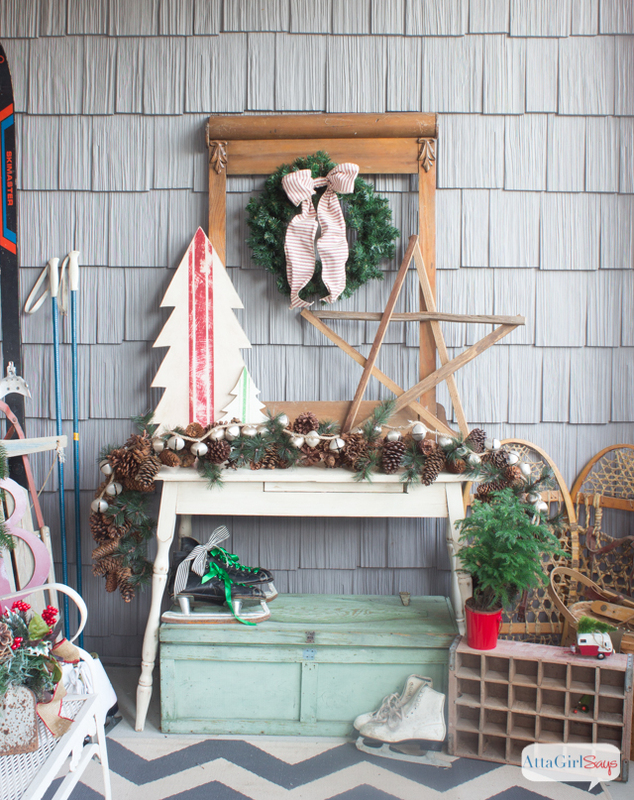 It all started with some gorgeous, wide chalkboard ribbon. 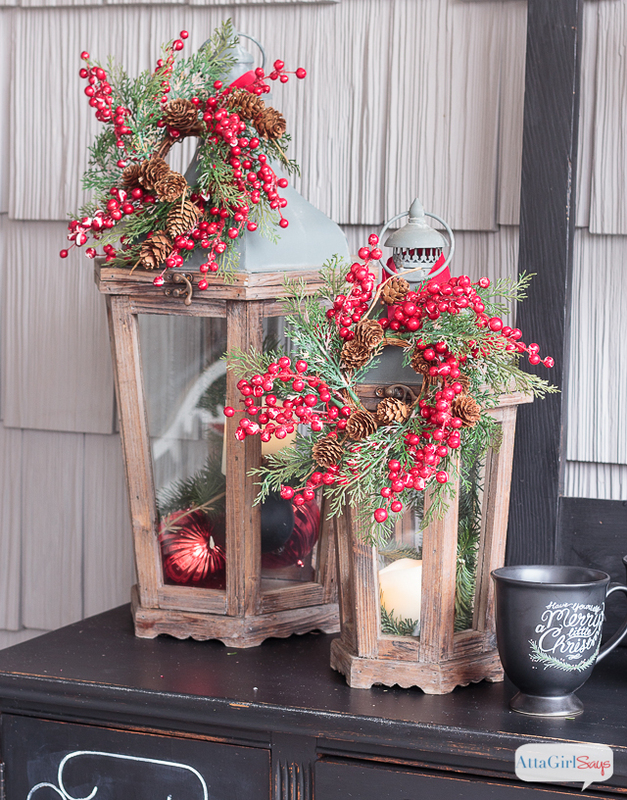 Throw in a some vintage Christmas decorations, greenery and ample pops of red, and the result is a gorgeous front porch decorated for Christmas. Who wouldn’t want to spend time relaxing in this beautiful space? It’s so welcoming and festive! Welcome friends to our holiday home. 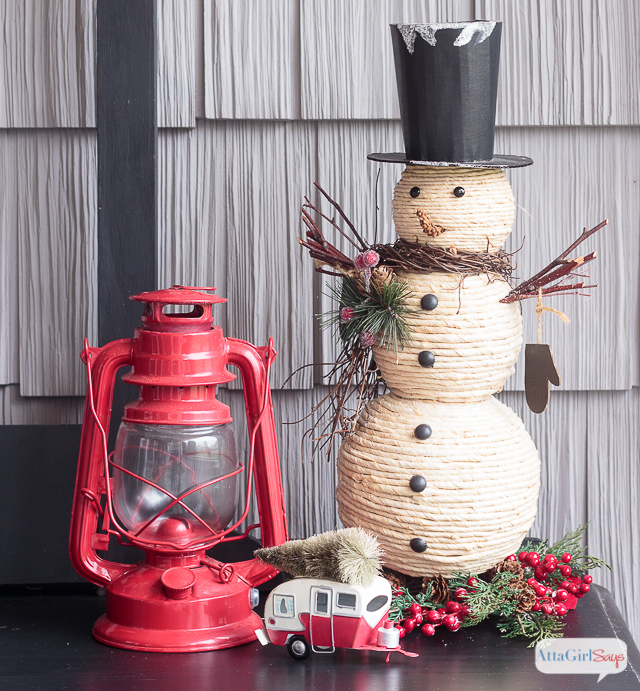 I’m very excited to be showing off our front porch, bedecked with lots of vintage Christmas decorations, chalkboard elements, greenery and bold pops of red, as part of the Welcome Home Tour with a talented group of bloggers. You’ll find links to their home tours at the end of this post. We’re each sharing a welcoming space in our home, and I couldn’t think of a better place than our front porch. 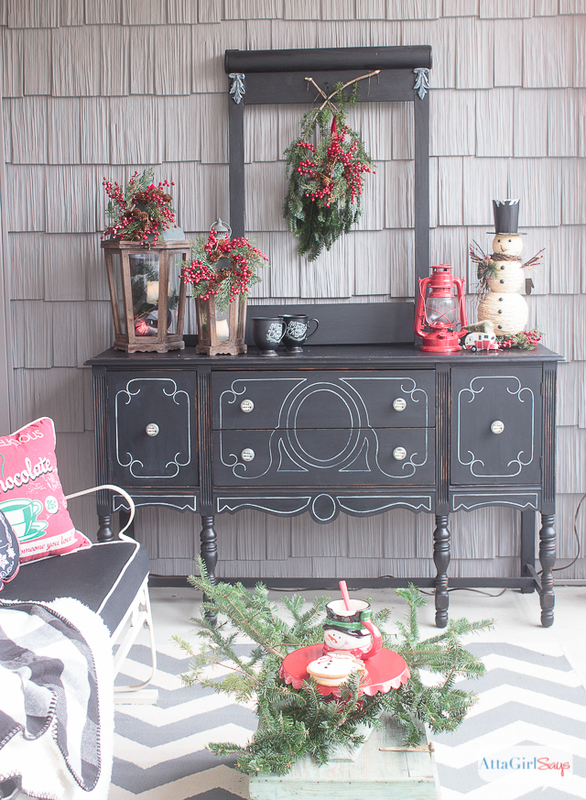 It might be my favorite space to decorate because I can go crazy with rustic and vintage elements. This post contains affiliate links for products that I use, love and recommend. If you click and make a purchase, I will earn a small commission, at no additional cost to you. Read my full disclosure policy here. 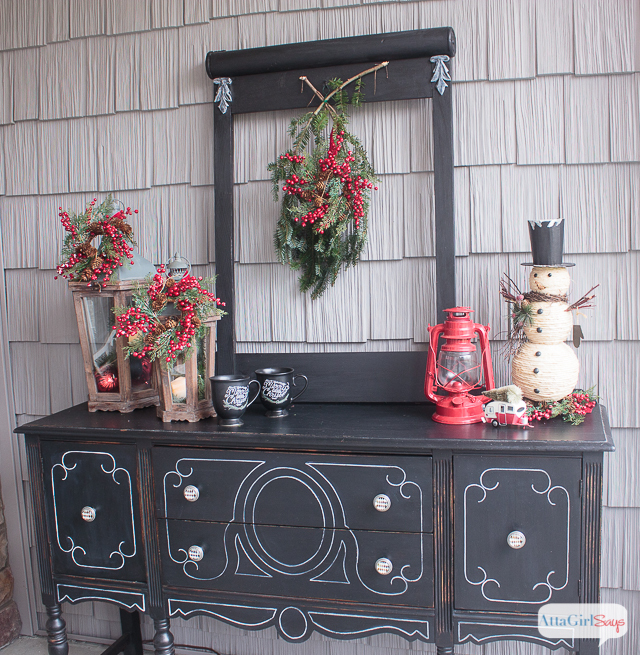 Although this year, I went a little bit different route, focusing on a limited color scheme — red, white, black (with a touch of green) — all inspired by the black buffet I painted this summer and this gorgeous chalkboard ribbon I found LAST CHRISTMAS! Enough with the chatter, let’s get on with the tour. 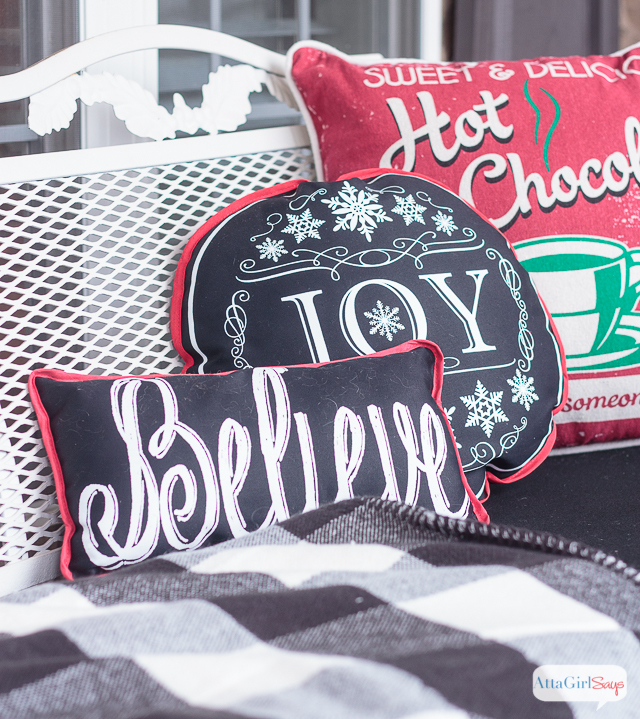 I added a cozy buffalo check throw from Target and some inexpensive throw pillows from At Home to create a cozy space to relax and sip a cup of coffee. And check out that little snowman Jackson and Bruce gave me last year for my birthday. His little mittens look like tiny chalkboards. Totally planned it! Ok, but I did totally plan this. 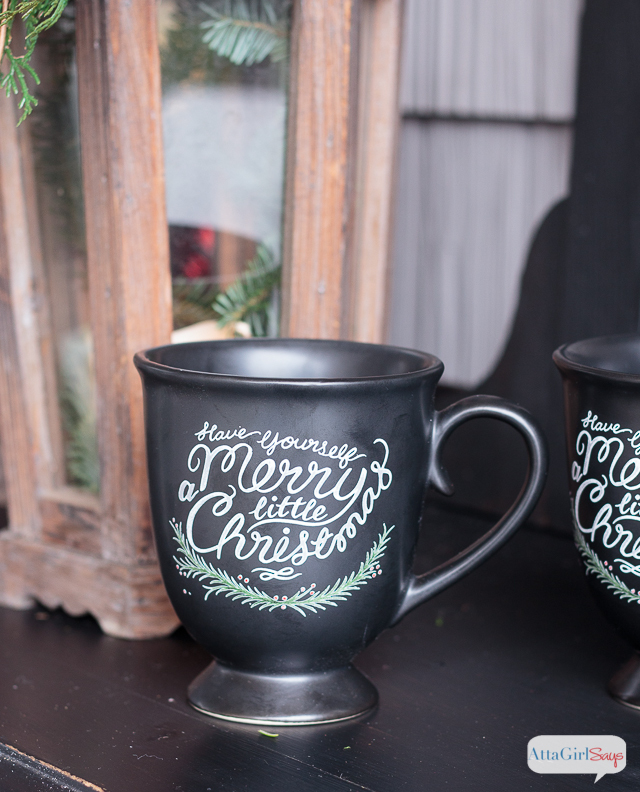 How could I pass up these Christmas chalkboard mugs at World Market? And I used chalk markers to freehand festive sayings on black shatterproof Christmas ornaments in another nod to the chalkboard theme. Since I love piling on the designer details when I’m decorating, I had to raid my stash of vintage items to finish up the porch. Most of these I’ve collected at yard sales, flea markets, antique sales and through begging, borrowing and stealing (with permission) from my mama. 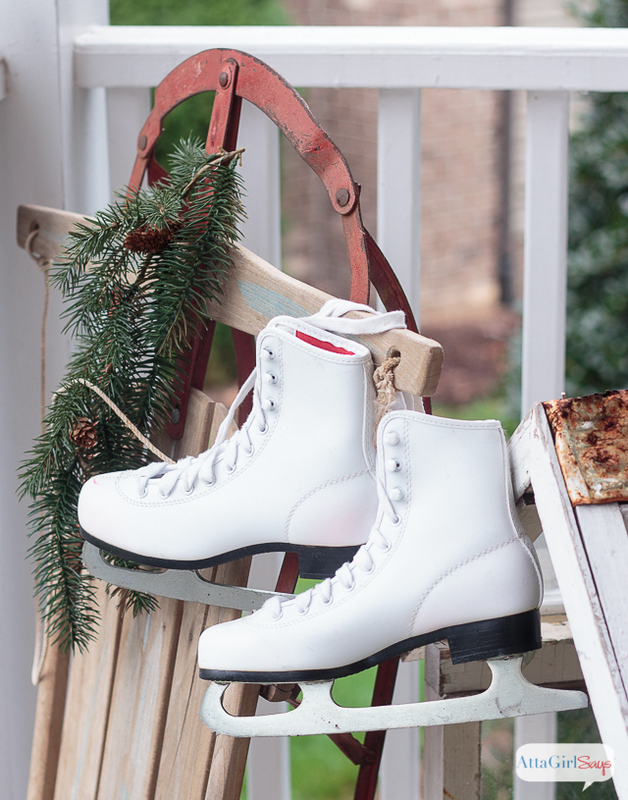 I’ve ice skated one time in time life — in college — and that was enough. 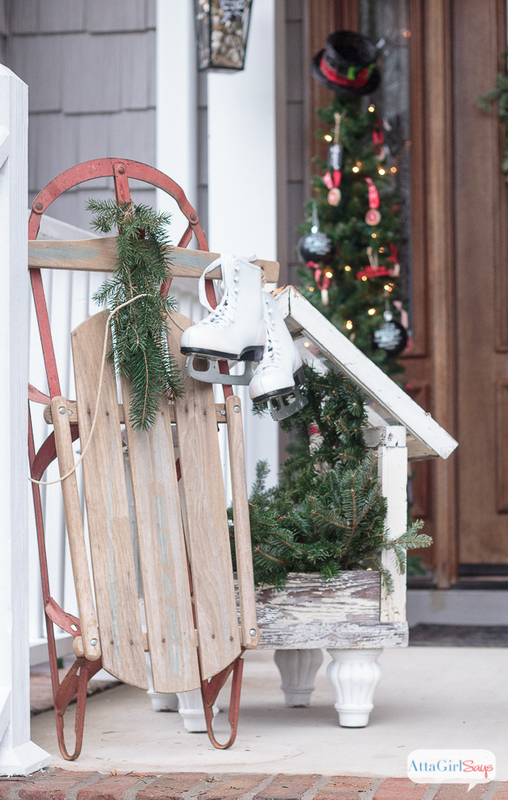 But I own three pair of ice skates because they’re just so darn decorative and photogenic. 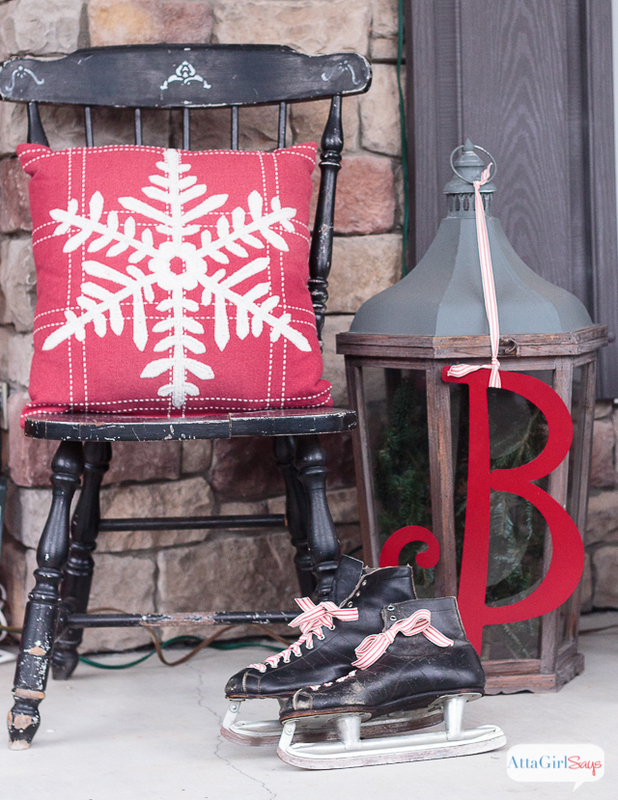 Especially when you hang them from a vintage sled or lace then with ticking ribbon. My Park Hill lanterns aren’t vintage, but they certainly have that look. 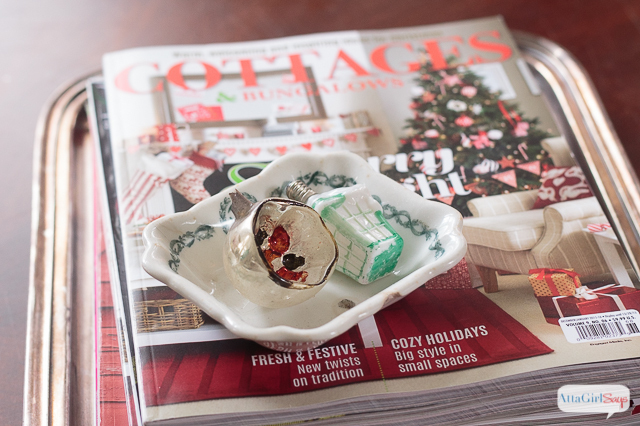 It’s always fun to figure out how to fill them and decorate them for the seasons. I love hanging our red family monogram letter from the largest lantern. Now that I see the porch all pulled together and can take the time to enjoy it, I am really proud of how it turned out. Because I’ve been nervous that it wouldn’t measure up to last year’s Christmas porch. The one that helped me realize a dream I’ve harbored since I started blogging. 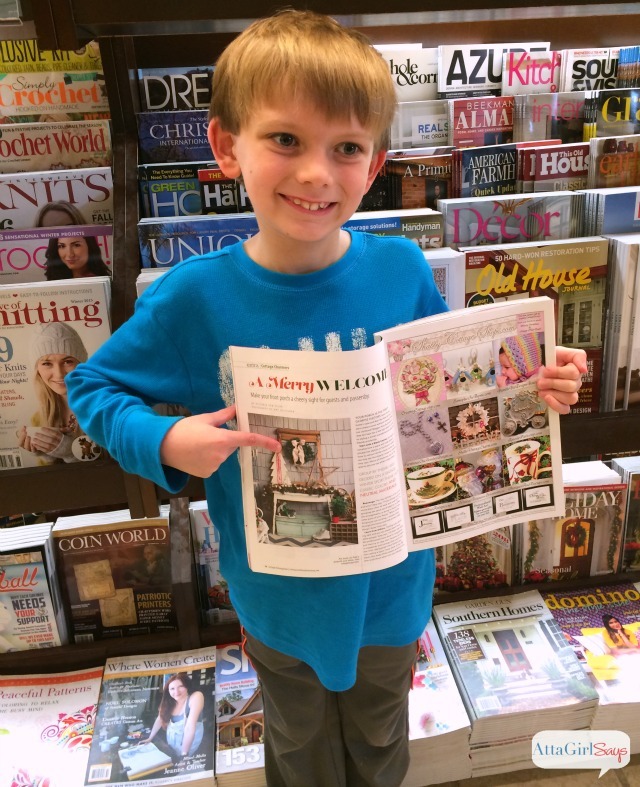 I’ve always dreamed of having a space I decorated featured in a magazine. Clearly, my porch is having its 15 minutes of fame. So this year’s space has a lot to live up to. I don’t know what the magazine editors will think, but I love the space and I think it will serve as a nice welcome to guests who visit us during the Christmas season. Thanks for stopping by. Don’t miss the rest of the Welcome Home Tour participants. Thank you, Sonya. I do love the space, and I’m glad you do, too. Oh my gosh, Amy. Your porch is amazing! This one should be on the COVER of a magazine. Congrats on the feature. That’s awesome and very well deserved. 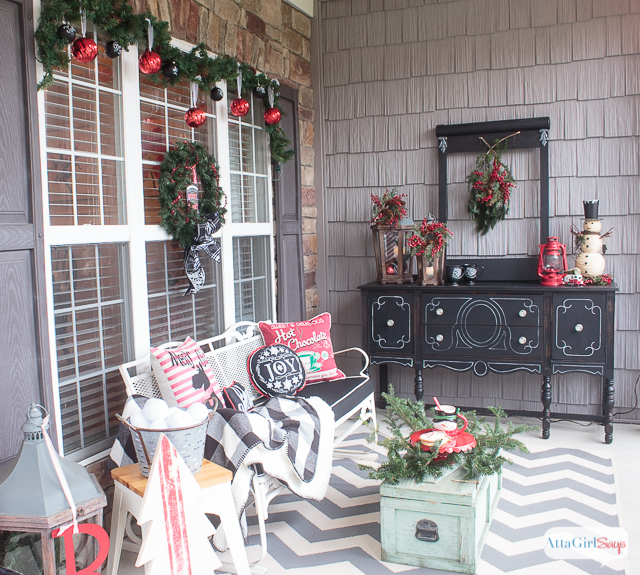 I always love your decorating ideas and this porch is one of the most fun ones I’ve seen. Thanks for the inspiration! 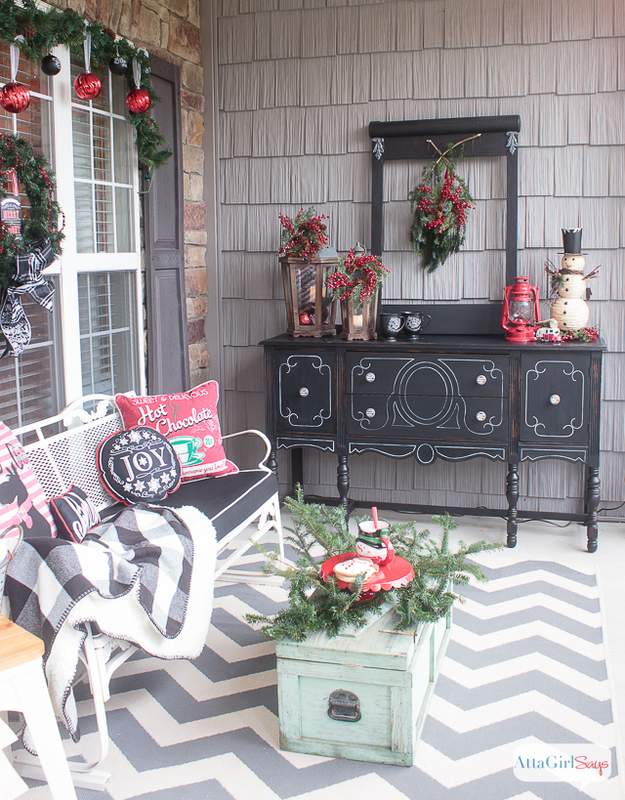 This has to be the most beautiful Christmas porch I have seen so far…Love every detail you put into it! You had me at chalkboard! Amy, seriously, your porch is beautiful!! 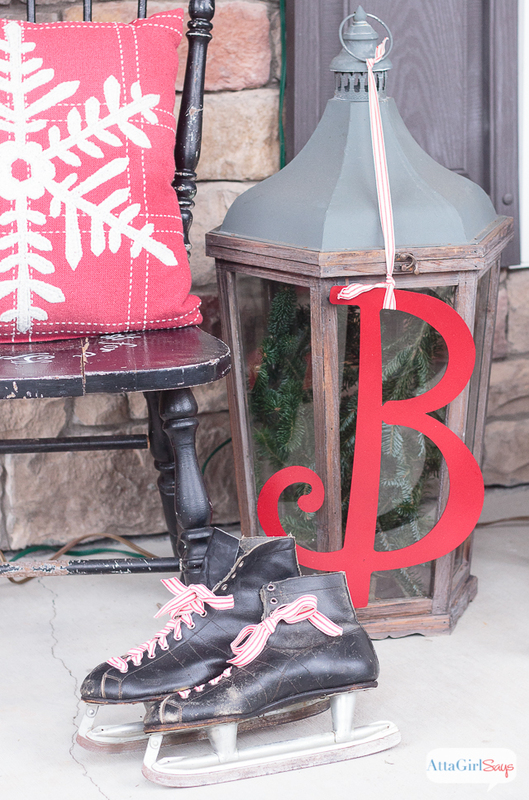 I absolutely love every detail – I’m pinning like crazy! Thank you, Angie. I love pins! This is so amazing Amy! I love everything about it, the colors, the styles, everything!! I love that you have that big of a porch to decorate! Having a big porch is definitely one of my favorite things about our house. It’s big enough for parties and sheltered, too, so I can put furniture out on it without worrying about it getting ruined in the elements. 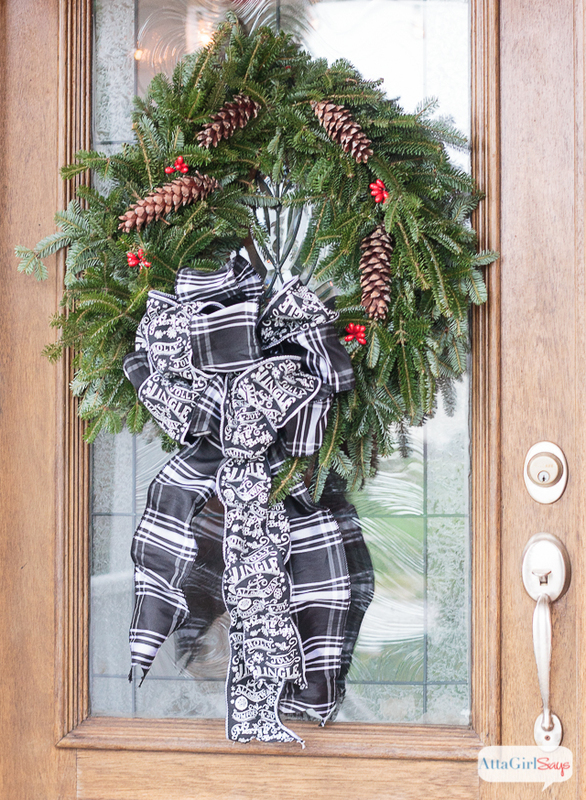 Your porch looks beautiful and is just as magazine worthy as last year’s. I love every single detail. 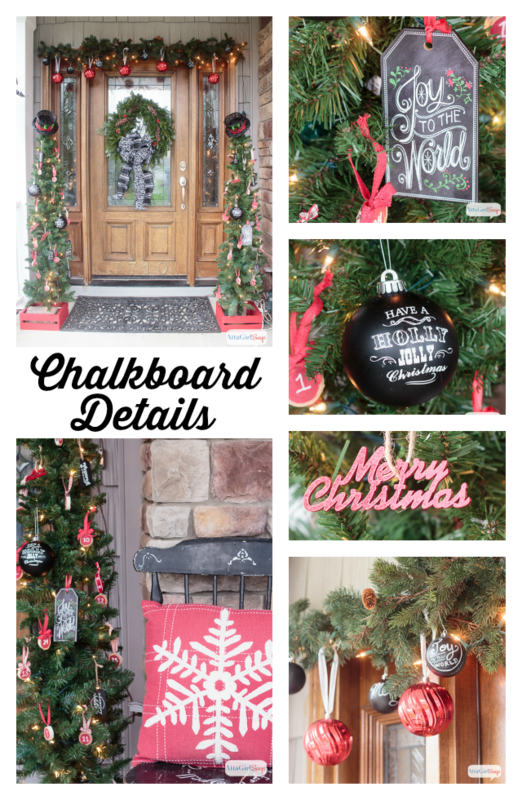 I absolutely LOVE this years porch (and every year , of course) but you have outdone yourself with this chalkboard red and black and nutlike AMAZING!!!!! Thanks for sharing!!! Love the look! 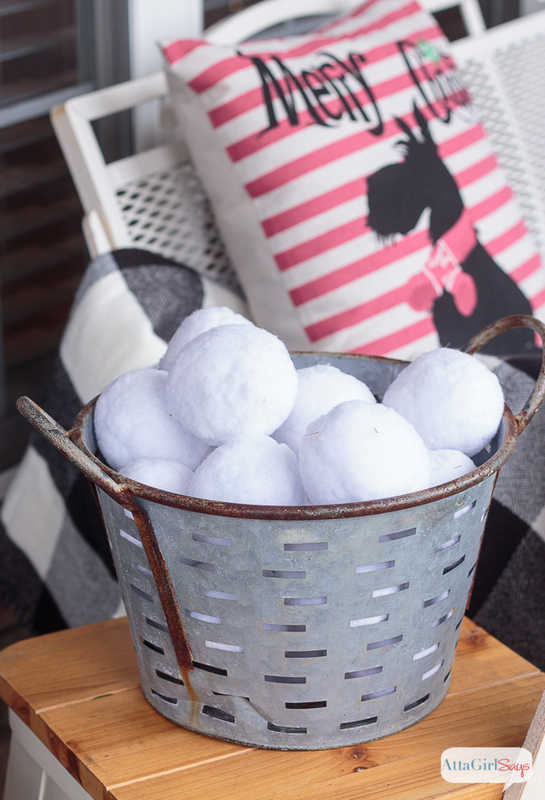 I ordered two snowball sets for the Wilmington kids. Oh goodness, Amy – it’s amazing! I love every tiny detail. Wow! This space is a show stopper! Love it all! 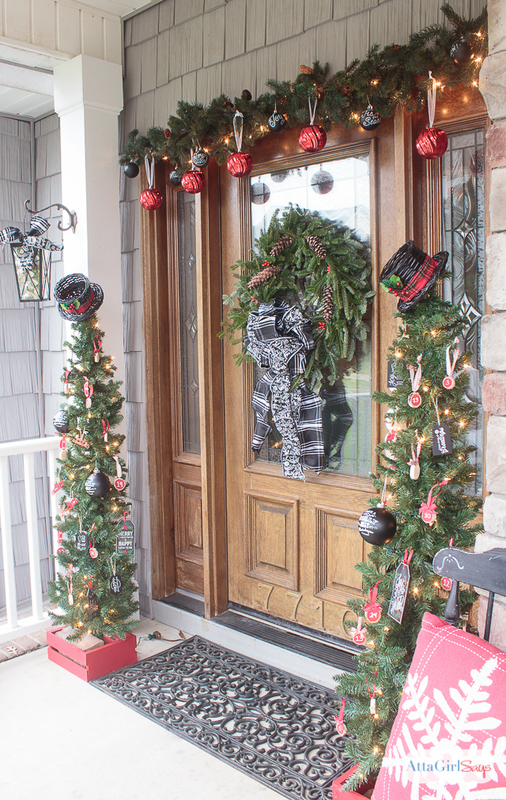 As I sit here, my porch has not been decorated for the holidays at all — so sad! Now I’m totally motivated to get moving! Merry Christmas! Thank you, Julie. At least it’s warm in Texas. 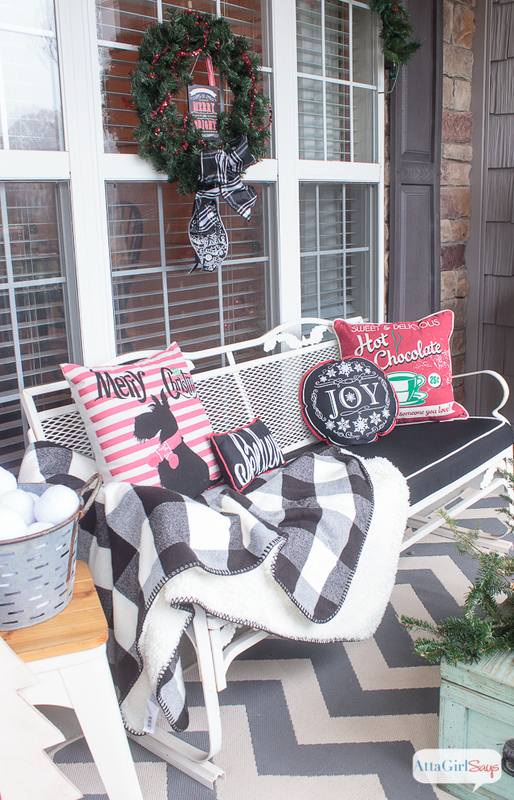 I love decorating my porch for Christmas in shorts and a T-shirt, which is usually how it is here in North Carolina in the fall. It’s just now turning cold. Everything is so pretty Amy. I don’t know which is my favorite. I need some of those ice skates. They are hard to find at the junk stores. 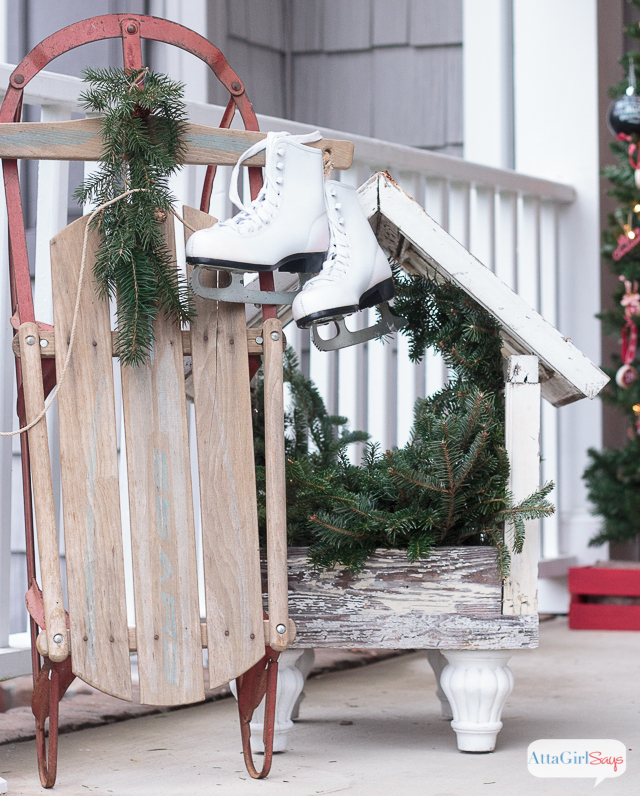 Funny story about one set of ice skates that I bought at a yard sale. The people were from up north, and I guess they thought I need to be educated on what ice skates were used for. I might have said something snarky back…about hanging them on a sled! What a beautiful porch!!! 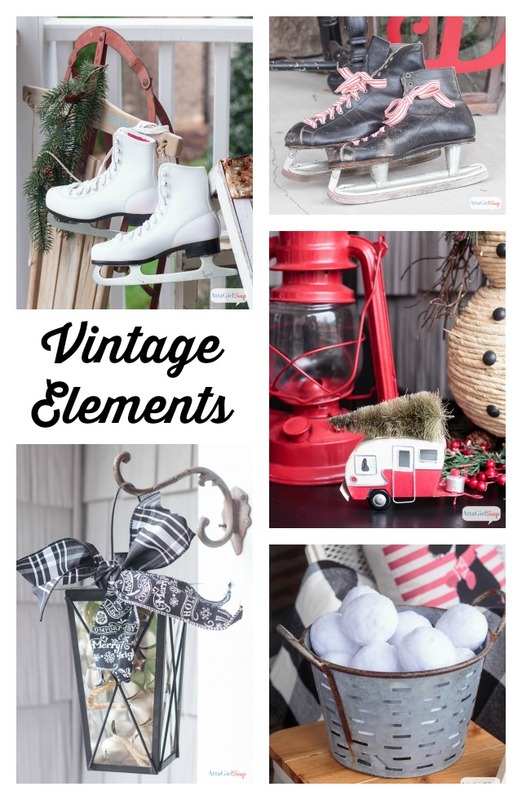 I love your style with all the vintage touches!!! I think it belongs in a magazine just like last year’s. Thanks so much, Michele. I’m pretty smitten with our porch this year, too. Wow, that is so beautiful! 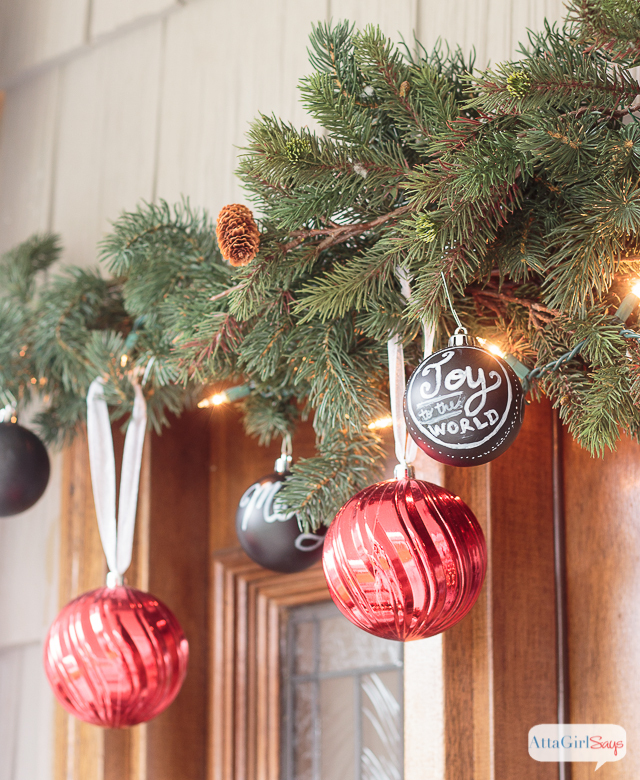 I LOVE, LOVE, LOVE all the chalkboard details and those faux snowballs!!! 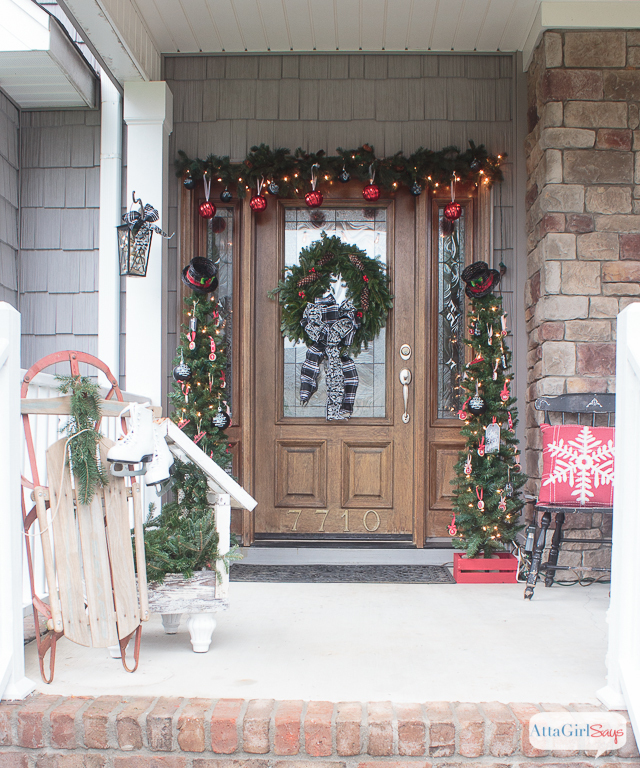 Amy, your porch is simply stunning – I absolutely love every single thing! Stopping over from Reasons to Skip the Housework and definitely pinning! 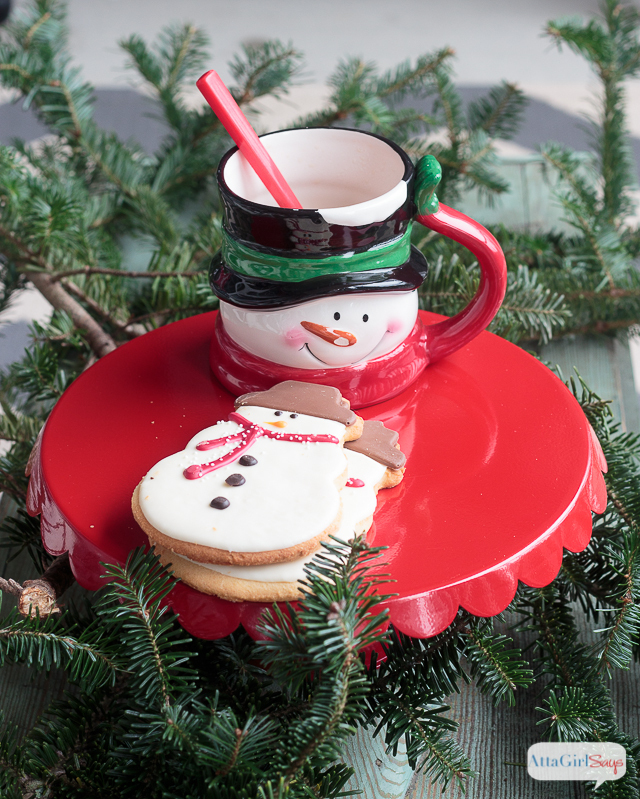 Thanks for sharing – have a happy Sunday and a merry, wonderful holiday!